I’ve been very pleasantly surprised at how often we’ve used the GoPro Hero cameras that we’ve owned for the past three years, and whilst we’re not that active a family, there’s barely a week that goes by without some opportunity for capturing footage – cycling, hiking, skiing, sailing and the like. There are plans afoot to buy an additional camera or two some time soon in order to offer more options when on the go or during group activities. As many other GoPro owners have found, there’s an element of addiction involved – the range of GoPro and third-party mounts and attachments available lead the user to think there’s always a better way to capture more compelling shots and viewpoints. Also, as the cameras are often most actively used when already wearing or carrying bulky equipment, new options that make it easier to carry, attach or detach the devices are of interest. GoPro’s own options tend to be pretty expensive to acquire, but are typically of high quality, and give that reassurance that they’re not going to break whilst in use. There’s no doubt that there is a ‘GoPro tax’ at work (as there is with Apple), but my opinion is that in most cases it is a cost worth paying to acquire equipment offering the most utility and style, with the least risk. The Seeker backpack – a new 16L weather-resistant sportpack, with space for your personal gear plus compartments for up to five GoPro cameras and a pocket that accommodates your own hydration system. 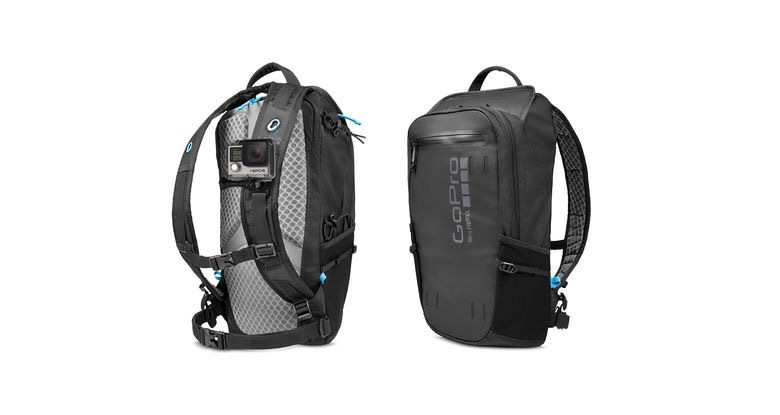 Features built-in chest and shoulder mounts which make it easy to attach the GoPro to the pack itself, plus a system of pockets and clips to hold a 3-Way for over-the-shoulder shots. The Pro Seat Rail Mount – a new discrete and streamlined mount for rearward-facing cycle shots, with simple one-screen mount for attachment to twin-rail saddles. Great for capturing race footage or for safety purposes on commutes. The new Pro Handlebar / Seatpost / Pole Mount – a super compact (and expensive) aluminum mount designed for serious cyclists and bikers, which rotates 360° and fits 22.2mm to 35mm diameter tubes. There is also a new side and rear helmet mount, but I’m personally less-than-keen on any options that compromise helmet safety. 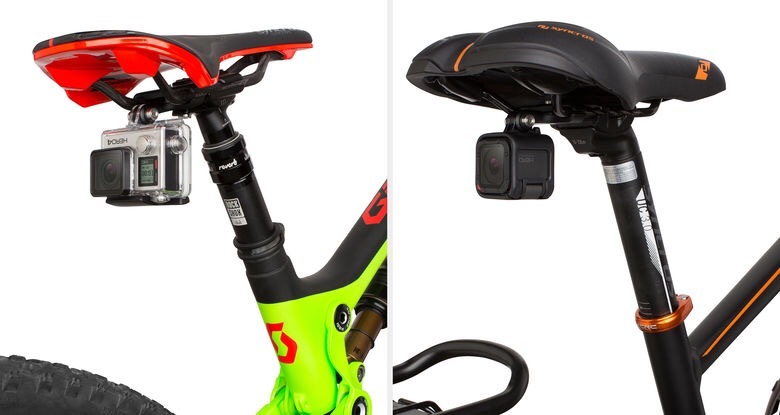 It is $170/£150 so you will be paying a premium for the brand, but the three mount options included are really attractive (plus potentially there is a fourth by attaching a helmet mount to the rear of the pack). 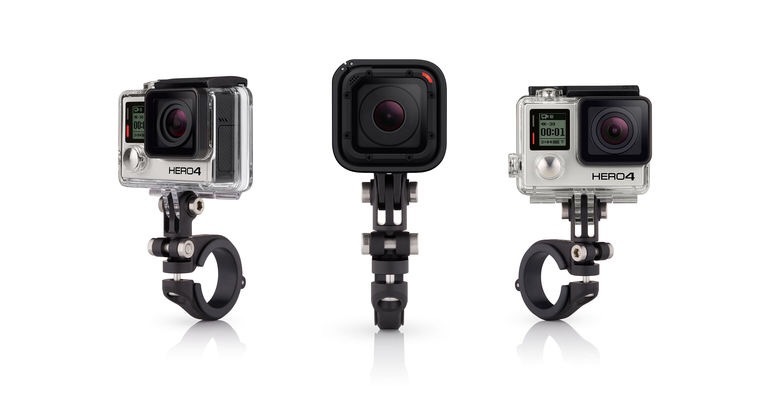 Get it from GoPro or from Amazon.